When I took Reporting I in my junior year, I never used a recorder because I wanted to be comfortable reporting stories without one. Now, if I’m covering something and I don’t have a recorder, I don’t have to panic because I know I have the skills to get by. This happened to me during my summer internship. I had to cover a women’s junior college basketball all-star game and I’d left my recorder at home. I had to talk to a lot of people (players, coaches, scouts, etc.) and take hand-written notes, but the story turned out fine. Whether to use a recorder is one question many students have. I say you should know how to report without one. That being said, once you are working for a paper, the only reason you shouldn’t use one is when your interview subject declines to be recorded. Athletes do not practice speaking in cliches any more than sportswriters attempt to write them. But, you know, sometimes a good cliche is worth a thousand words. You can take that to the bank. But cliches can also be confusing — even to a hard-nosed fan, someone who is a gamer, a serious student of the game and a go-to guy for sports trivia. Ebby Calvin LaLoosh: Got to play… it’s pretty boring. Crash Davis: ‘Course it’s boring, that’s the point. Write it down. We should not interview athletes and coaches for quotes. Instead, we need to speak with them to get a better understanding of a game or play, to get explanations for decisions, and to add a little flavor to a story. Quotes should answer questions, not create them. That means asking the all-important follow-up question if an athlete or coach offers a statement that is vague or unclear. For example, what does this quote mean? “Once we have balance, we will be a very deadly force.” In what ways does this team need balance? How will the team be deadly? Ask this coach to explain. I know sports reporters, especially newer journalists, are uncomfortable asking these follow-up questions, feeling this either challenges an authority figure or makes the reporter look like a dope. Actually, reporters look foolish when they fail to fully understand everything about a story, game, or profiled person. Ultimately, coaches and players will appreciate that you want to get it right. Here are a few more quotes that could use some clarification. • What particularly has this person upset about the loss? Teams lose all the time, so why is he so upset? • How hard are these players willing to work? Get some details regarding this training. Show, don’t just tell. Then offer these details to a reader who can determine if these players are really working hard. • In what specific ways does this team need to play together better? Ask f0r some examples. • Get some examples that reveal that the team has chemistry. In what ways are the players getting along? Ask for a story or two. • How is this baseball player trying to stay focused? Is he doing yoga (or just reading hitting tips from Yogi?) Is this player taking an extra 30 minutes or 100 pitches each day? Get the details. • How is this doubles team particularly strong? Is one player great at the net and the other a terrific server? Are the players psychic? How is this team winning most of its double points? Ask. “I think it’s going to give us some good momentum going into conference,” she said. • This is as cliched as it gets. It says nothing when it appears to say everything. How does a victory or good performance help a team in its next game? Is this team now confident it can rally from behind in the fourth quarter? Did a point guard start making some tough passes inside? Ask for particular details so the reader can understand how this one game might assist the team in the future. Sometimes, I can’t sleep so I sit, bleary-eyed, and retrace the day’s events while my body struggles to stay awake. At times, I drive around town with the other night owls and insomniacs. A few years ago, this led me to a Wal-Mart at 1 in the morning where I bought party favors for my daughter’s fourth birthday. As I checked out, I started to grow exceptionally weary (and grouchy) as the older woman at the register worked slowly, taking more time than necessary to handle and scan the pointed party hats, the sound blowers, and the napkins. I could barely stand. I was impatient and about to blow — until she started telling me her story. Nobody else was in line behind me, so she proceeded to tell a story about a young mother who believed her mother-in-law was getting too pushy and about a son who would not defend his mom. This woman said she was probably to blame, but she did not know how to solve the problem. She really missed her little grand-daughter. I listened for about 10 minutes until somebody else came to the register, someone who was probably buying some late-night snacks or biding time until sleep overcame him as well. I hope the young guy also stopped to listen to this poor woman’s tale. Too often, we forget to listen — especially during interviews. Journalists gather information through research, interviews and observation. But interviewing might be the most important skill of all. A sports reporter cannot just show up at a game, watch it, and then ask several general questions at the end — unless, of course, the reporter wants to write a story that makes editors’ eyes roll and readers’ eyes glass over. Sports journalists need to be prepared before heading out to a game, or walking over to a practice, or talking with a person for a profile story. We need to do some homework – and then be prepared to ask follow-up questions during the interview sessions. Below, I have compiled some techniques that can help draw out significant information during your interviews. Consider why are you interviewing your source and what you want to get out of the interview. Hope this helps. Imagine taking a final exam without studying. (Nah, you’ve never done that.) A good interview requires significant research, where you read as much as you can on those you will speak with and on topics you will address. Great questions come from sweat and hard work. They do not come by staring at a blank page, thinking hard, and hoping a muse comes. Read everything related to the topic or the person to see what has been written beforehand in order to focus on the more interesting aspects of the story and to see what has not been covered so you can delve into that. Check newspaper archives and government sources. Also, do some background interviews to gather information. That might mean walking around a campus, speaking with those along the way, or it might mean informally talking with people who know the person you plan to interview. The research may yield a perspective that is not typically addressed. Stephen Jay Gould, the noted natural historian, for example, adored baseball. That’s a topic that he preferred to speak about than the repeated questions about paleontology. I found out that Don Baylor loved to speak about the art of hitting, as did several other players on the Atlanta Braves. They spoke endlessly about hitting even though they were busy. I had to pull myself from them. People like to know why they are answering questions. Put the source at ease by letting them know about the subject matter. “Hi, I’m Joe Gisondi of the Daily Eastern News. We’re trying find out what students feel about some of the issues.” You might also tell them what you want to learn in this interview. This should be the first question, even if you have seen the name printed before. Game programs are especially bad at spellings. Once, we had a student on campus with a name that sounded like Fred. In reality, the student’s name was Phredd and the student was a female. You’ll come across many names that are spelled in varying ways, such as Jon/John, Sarah/Sara, Kristen/Kristin, and Kathy/Cathy. Do not just act as a stenographer, mindlessly scribbling down whatever anybody says. Rather, question anything that is unclear, unfamiliar and unverified. We are reporters first, which means verify everything. In many ways, interviewing is about listening, learning, and adapting. You are not the focus of the story. Don’t tell sources what you think; they don’t care. It’s about them. Bruce Selcraig of Sports Illustrated said, “Experts appreciate that you’ve done your homework and can ask intelligent questions, but they don’t want to hear you talk. Don’t try to impress them. Let them impress you.” You can set up questions, but don’t ask questions to hear yourself speak. Offer concise questions. Basic, simple questions solicit clear, lucid answers to even complex issues. Interview people outside of the world in which you publish. Find out how the city budget in your town compares to those in other towns. And the budget at your college compares to others. Interview people in other areas so the reader can gain a better perspective on the news events. Speak with coaches and players at other schools. Call athletic directors in other conferences and other states. Ask questions that give the reader a better perspective on the news or the person profiled. Ask yourself, essentially, how does this all affect my readers? Coaches say their pitchers threw perfectly, their quarterbacks were off the mark, their runners were fatigued and their teams were stale. But what do all these adjectives mean? Find out how and why the pitcher threw well. Did the pitcher mix it up better, throwing more off-speed pitches on 1-2 counts? Check with the catcher as well. Were the cross country runners tired because a bus broke down, because they ran three races in 10 days? Find out the reasons behind the statements. The follow-up question offers perspective and supplies answers. especially if you suspect the source will end the interview when you ask the question. That way you can get other information first. Ask sources to expand on general statements, such as “the stadium was in bad shape.” Were bleacher boards cracking, pipes constantly bursting and rusted nails falling out of walls? Make the source prove his point so you can illustrate ideas to your readers. Details enable you to put the reader at the scene. That’s why you would keep focusing in on specifics when the source is inclined to give you general information. You never know when details will be important. I’m not an expert on environmental science so I would ask why the water in a lake is tannic and would ask for clarification in terms such as secci disk. That way I can offer information. If you are working on a music story, ask the musicians to describe or define terms such as “baroque” or “repertoire.” What do these mean to the reader? In sports, ask for definitions of sports terms. If you do not know what Fartlek training is, ask the cross country coach to explain it. If you do not know what a nickel package is, ask the football coach. They will appreciate that you want to learn more, that you will want to get it right. If you do not completely understand what the source said, ask him to repeat what he said. For example, if a sources says that music is “actually a textual painting of an artist’s poem,” you will definitely need to ask them how particularly this is so. I’m still perplexed by that quote. “Don’t you think…?” Most people like to be liked and will agree with you that the weather is great. They might answer the exact opposite five minutes later to be liked by another person. Information and response lack credibility. You are an expert in journalism, not on the topic being discussed; otherwise, you would be getting interviewed. Call experts and celebrated people to get perspective and information. Call the President. You’ll be amazed how accessible people can be. The worst that can happen is you get stonewalled. The best is a great interview or source in a story. If you are working on an advance on an author, call the New York Times book reviewer or other noted authors in the field. Keep people talking because you never know what you’ll hear. Plus, people may lower their defenses. The reporter politely said she could not do that and cajoled this woman to talk some more. The woman eventually offered the correct spelling of her name before re-emphasizing that “everything was off the record.” Michelle kept the woman talking. Eventually, this woman discussed the loss of her home and her pet in the tornado. She could not have kids so the pet was like a child to her, the woman said. The lady then invited our reporter into the trailer to see her cat, where Michelle could observe this woman more. Remember asking your parents to tell you a story? Same thing. We all love hearing stories. Ask about the minute details about the setting, clothing, and temperature. And then write this story much more concisely in your own words. A Des Moines Register reporter heard the police chief say he missed a meeting because he was too tired planning the Pope’s visit to town. The reporter did not blurt out: “The Pope’s coming!” Instead, he said, “Oh yeah. Is that next week?” Act like you know new information. … if you are verifying information. You can also add a follow-up question. … unless the source digresses to a more provocative or amusing angle. Get sources to unfold arms and be more open. People whose arms are crossed are often uptight or uncomfortable. Before you start asking the more pertinent questions, gab with them for a little while and see if they start uncrossing their arms and opening up. While interviewing, lean in to show you care. Think of the dialogue as conversation. And be honest with those you interview if you expect them to be honest with you. If they trust you, they may give you information ahead of time, knowing that you will not reveal it too early. But you will be able to do the research before the story breaks. Don’t tell them what the specific angle will be, when the story will be running, or that they can review the story before it is published. • What’s the most bizarre thing you’ve ever seen? • When did you realize there was no Santa Claus? • When did you realize life was unfair? • What’s a perfect day? • What’s a typical day? Keep the tape recorder rolling. The person interviewed sometimes offer significant stories or details as you or they are leaving. That’s where confessional information is occasionally offered. At this point, sources are more relaxed, thinking the interview is over. A good journalist can interview and write a decent story on anyone if he does enough work and pays careful attention during interviews. Everybody is worth a story. The woman at Wal-Mart made me think of a line from a favorite poem by Yevtushenko entitled People: “When people die, worlds die with them…the first love, first kiss.” For this reason, people hope to live on by telling their stories, even if that means thousands of people will read about embarrassing or poignant moments. Let’s make sure we treat these stories, and our sources, with the respect and empathy they deserve. In print, most newspapers will include a scoreline above the story for home-town games. 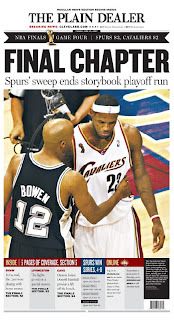 That’s what the Cleveland Plain Dealer did last night when the Spurs completed a sweep of the Cavaliers (see page above, right). And that’s what most newspapers do for big games, whether that is an NBA championship or a prep baseball district playoff. If the game is big, the results are frequently known before fans read the story. Fans can follow games online or can scan for scores on their phones. (We’ll see how technology, like the new iPhone continues to change the media landscape for both content and design/presentation.) On some occasions, bigger games can be written more straightforwardly where a key play or angle ties into the score. For example: “Jorge Posada drilled a two-run homer in the ninth to lift the New York Yankees past the New York Mets on Friday night, the team’s 10th victory in a row.” This is not a lead you would read in New York, where fans will know the score. But this might be the lead used in a baseball roundup published in Lincoln, Neb., or Salem, Ore. There is still a place for straight, concise leads. You might write a straight lead for some high school games where fans might not know the score, although I would encourage you to develop more creative leads linked to solid reporting and analysis. But you probably want to elevate the score in most prep game stories where the results are not so widely known. Still, in many cases the straight lead where the score is offered is passé. Take last night’s NBA Finals, where even the Associated Press writer waited until the third graph to offer the score in his first lead write-thru. CLEVELAND (AP) – True roundball royalty, the San Antonio Spurs are once again wearing the crown. LeBron James, Cleveland’s preordained King, isn’t quite ready for his. Finals MVP Tony Parker scored 24 points, Manu Ginobili had 27 — 13 in the fourth quarter — and the Spurs, who bounced over from the ABA in 1976, moved in among the NBA’s greatest franchises with an 83-82 victory Thursday night for a sweep of the Cavaliers — court jesters through much of their first finals. Most AP writers offer several write-thrus, particularly for bigger games like this. That means a writer will file a quick deadline story for newspapers needing something before their first deadline. Then, the writer will go back to elevate a buried lead, to embellish some main points, or to add quotes and new information. These later write-thrus are used for newspapers with later deadlines, second editions, or who publish in the afternoon. By the fourth lead write-thru, the AP’s Tim Withers develops a solid lead around observations that offer perspective on an historic victory. The score is not cited until the 10th graph. CLEVELAND (AP) – Once again, the San Antonio Spurs walked the hallways in champagne-soaked T-shirts. Bruce Bowen carried the Larry O’Brien trophy, one he had cradled before. Tony Parker, wrapped in France’s flag, squeezed an MVP award he richly deserved. This wasn’t their first NBA title. But for the Spurs, it’s the maybe the one that means the most. Champions for a fourth time in nine years, they’re now a dynasty. True roundball royalty, the Spurs again wear the crown. Parker scored 24 points, Manu Ginobili had 27 — 13 in the fourth quarter _ and the Spurs moved in among the NBA’s greatest franchises with an 83-82 victory Thursday night for a sweep of the Cavaliers — court jesters through much of their first finals. In comparison, few readers would have known the results of the following American Legion baseball game before this morning. CHAMPAIGN – Neil Wright’s hit to left-center scored Derek Leemon from first base, the winning run in Champaign’s 4-3 11-inning win against Mattoon in Wednesday’s late American Legion baseball game. A straightforward lead works fine here. If this team should reach the state tournament, the lead would need to be more creative (and the score could be dropped down.) I expect the local newspaper would then put the game results in a scoreline above the headline or in a fact box, something that is unnecessary for a regular summer Legion game. Like everything else in journalism, audience is the key to your approach to coverage. You can get away with burying the score in games that readers have probably followed, like a professional baseball game or a prep championship. Just make sure you’ve done enough reporting to write a lead worth reading. As we all know, it’s not over until the fat lady sings (humming won’t do). That’s why we need to follow the games intensely, leaving it all on the floor like the athletes we cover. Each time we head out to write another gamer, it’s a whole new ball game. Teams that lose always seem to be out of synch, lacking composure to get back on track and leaving them with a tough road to hoe (or even to rake). Even winning teams have some challenges since no lead is safe. (Just ask the Cubs.) These teams cannot afford to be lackadaisical; instead, they need to go for the jugular in order to blow the game wide open. Let’s face it: We get an awful lot of these clichéd comments from coaches and athletes. 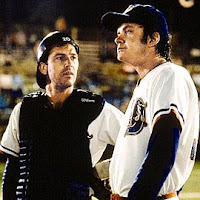 This is not lost on athletes, even fictional ones like Crash Davis, the veteran catcher in “Bull Durham,” who mentors Ebby Calvin LaLoosh on many things – including how to respond during interviews. But sports reporters should not write them down. Instead, we need to fire off follow-up questions. Too often, sports reporters act more like stenographers, writing down whatever anybody blurts out. We need to more discerning, evaluating whether the words offered are worth repeating. Quotes should answer questions, clarify points, explain a process (like throwing a screwball), or offer insights into some aspect of a game or individual. Too often, sports reporters ask a few general questions, scribble down some quick quotes, and rush back to write a game story that does not reveal insights into the games just played. Here are a few tips to consider when you are out covering games. 1. Get in the habit of asking follow-up questions, which allow you to acquire interesting stories, to gain illuminating insights, and to explain points related to the game. For example, imagine a coach just told you: “The Aggies have a great pitching staff. It should be three tough games for our hitters. But our guys are coming around, and we expect to be able to put up runs.” You need to ask: What makes the Aggies a great pitching staff? Perhaps, you’ll learn that each pitcher has four effective pitches or that two pitchers regularly throw 98 mph fastballs. Get these details so you can write more authoritatively – and so you can explain the situation to your readers. 2. Don’t ask questions to get quotes. Ask questions to learn about the games, to collect stories, and to verify information. You’ll get more quotes than you can handle along the way. I was taught: You write down about one-third of what someone tells you but you’ll probably use fewer than one-third of these quotes. I’ve found that percentage is pretty high. If I do my job correctly, I probably use fewer than 10 percent of what I’m told from coaches and players after a game. 3. Consider using indirect quotes that paraphrase or summarize what someone said. Indirect quotes can be just as effective as a direct quote. They also enable you to delete wordiness and clichéd phrases. I read through some college newspapers during the past two days for examples that would show what I mean in regards to quotes. These examples are not meant to demean any of these hard-working college students who are beginning to learn their craft. Rather, I am using the quotes simply to illustrate some points. ■ Avoid tag lines in quotes. Make the connection before you add the dialogue. “He is loyal to the athlete and our staff, and in turn we are loyal to him,” he said. ■ Ask for stories. You can then tell these stories more concisely and more interestingly in your own words. Prod people with additional questions during the telling of these tales, asking ‘When did that happen? What was he wearing? When did you know you were in trouble?’ These stories and anecdotes will enable you to show how someone is loyal. ■ Ask for specific details that enable you to explain and describe how a sport is diverse. Sports like archery or lacrosse, for example, need more explanation. Saying the sport is ‘diverse’ really says nothing. How is the sport diverse? Ask the people involved. As a matter of fact, you should ask several people. Then, you can synthesize the information into a summary that includes a quote or two. Currently around 20 people show up for meetings. “We are one of the biggest college archery groups,” Purpura said. ■ Verify information. Do not just report what people tell you. You should really go to a meeting or two and count people for yourself. This person could have made up this number. Don’t let people use you. ■ What specifically has this coach taught this player? Ask. Show this. ■ This is a typical cliché quote from a coach. Get specific examples of ‘ups’ and ‘downs’ from the season. Show a few of these. As you dig deeper, you will also mine much better quotes. “It was a tough tournament for us,” head coach Kim Evans said. “We will go back to the drawing board and regroup. We have a talented group of student-athletes and if we could play in a tournament tomorrow we would. We are putting this one past us and getting ready for the remainder of post-season and are very much looking forward to it,” she added. ■ Wow, this golf coach combined several clichés into one short quote. Dig deeper by asking ‘How specifically was this tournament tough? Can you cite an example or some moments when the tournament seemed tougher?’ Don’t let this coach put this one past you and the readers. Ask the follow-up questions. ■ How huge was this win? How does this win compare to past victories? Ask how this will affect the team. Finally, here’s a pretty good quote from a baseball game story, one where the reporter must have asked how the player felt during a key play. Coughlin made the Bulldogs pay, ripping a towering shot to left center field to extend the score to 13-4. The Bulldogs added a run in the ninth inning off of junior pitcher Aaron Lovett before Lovett recorded the final three outs for his fourth save of the year. So weed out clichés, ask follow-up questions and talk to as many people as possible. This will lead to more informed, interesting stories. Good luck. Writing a sports feature is like writing a short story – except we do not make up any of the facts. Story, not news, drives these features. That means you need to grab readers quickly in a lead that tells a compelling story or introduces an interesting character. Too often, reporters go short in leads. Yes, lengthy, rambling leads can be a problem, but not if reported and written properly. From time to time, consider going long. The writer of the following story focused on an interesting topic – how hairstyles affect athletes’ performances on the field and in pools. This writer lead with a single person’s story. Again, a solid job. This writer could have developed the lead in more detail, allowing the reader to see and feel the worries this athlete had. Do not be afraid to go deeper in leads — if the story or scene is compelling. Leads can certainly get out of control, wandering and wandering while the reader also wanders and wonders: What the heck is this story about? But you’ll never know if you do not try. Here is the original lead. Eastern sophomore running back Norris Smith has dreadlocks to worry about. Defenders could pull his hair in trying for a tackle and it is legal. But, he said it has never happened. To get the dreadlocks Smith said he threads them up and lets them grow out. Smith said to get them to stay that way, he has to wash his hair and do the normal things when it comes to hair care. Norris said his dreadlocks are all natural and sometimes it takes one to two years to grow out. There is another way for dreads to grow. Smith said he can put weave in his hair and it will only take four to five months to grow out, but it’s not natural. Dreads are not the concern for rugby player and track athlete Samantha Manto. “In one of the (rugby) games last year, a girl was trying to pull me back by my jersey; she got my hair,” Manto said. Most of Eastern’s rugby players don’t have to worry about hair, since most of their hair is short. They have to pull their hair through helmets, though. Here is a possible revision, one that remains focused on the athlete’s concerns about dreadlocks. I have also added a nut graph. Norris Smith worries about his dreadlocks. They flow out from under his helmet, scraping against his neck and bouncing off his shoulder pads. They are a great target. Smith, a sophomore running back at Eastern, has already had his head yanked back a few times when defensive tackles and linebackers had grabbed his face mask. Smith knows defenders grab anything they can hold onto. The face mask yanks cost teams fifteen yards in penalties. But pulling his dreads won’t cost a team a single yard. It hasn’t happened yet, but he is still concerned. But not enough to cut them. Hair is a concern in many sports. Swimmers shave their heads (and other body parts) before big meets. Wrestlers and rugby players keep their hair cropped so it does not get pulled. And baseball coaches believe sloppy hair and wild beards can lead to equally wild, erratic play on the field. Smith, though, is willing to face his fears on the field in order to keep his dreadlocks. On your next feature, do the extra reporting and go long. But don’t forget the nut graph.